In the Second World War an international team of scientists and medics came together in Oxford to develop penicillin into a drug to save the lives of soldiers and civilians across the world. The Australian pathologist Howard Florey (1898-1968) became the Professor of Pathology at Oxford’s Dunn School in 1935. He shared the Nobel Prize in 1945 with Ernst Chain and Alexander Fleming for his role in the development of penicillin. A team of six women was recruited by Florey to ‘farm’ penicillin at the Dunn School. Nicknamed the ‘penicillin girls’, they were Ruth Callow, Claire Inayat, Betty Cooke, Peggy Gardner, Megan Lancaster and Patricia McKegney. Two of these women are pictured here, though their protective clothing also hides their identities. After fleeing Nazi Germany, Ernst Chain (1906-1979) was invited by Florey to join his team at the Sir William Dunn School of Pathology in 1936. He shared the Nobel Prize with Florey and Fleming in 1945 for his work on penicillin. Arthur Gordon Sanders (1908-1980) operated the penicillin extraction plant and worked closely with Heatley, Chain and Florey. Florey’s first wife, Mary Ethel Florey (1900-1966), followed him to Oxford from Australia. 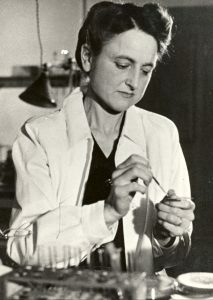 She supervised the clinical trials of penicillin conducted at the Radcliffe Infirmary, at military hospitals and at the Birmingham Accident Hospital. Dorothy Crowfoot Hodgkin (1910-1994) pioneered the X-ray crystallography of complex biological molecules and established the atomic structure of penicillin in 1945. She is still the only British woman to be awarded a Nobel Prize for science. Edward Penley Abraham (1913-1999) was a biochemist working in Oxford. He joined Florey’s team and after working on penicillin went on to investigate the therapeutic potential of another antibiotic, cephalosporin. Stuck in England after the declaration of war prevented him taking up a fellowship in Denmark, microbiologist Norman Heatley (1911-2004) went on to become a vital member of the penicillin team. Helping to investigate the toxicity of penicillin, Margaret Jennings (1904-1994) was Florey’s research assistant and became his second wife in 1967.
Credit: The photographs on this panel have been provided by the Dunn School of Pathology, Oxford.